Charlotte and Emily will have quite often walked to Koekelberg, to visit Mary and Martha Taylor, just as they will have regularly walked to the Pensionnat Heger to visit the Brontë sisters. The pictures below show how they would have walked. Nowadays one can still do this walk, apart only from the Rue d’Isabelle and part of Rue Terarken bit. When starting the walk at the Koekelberg Pensionnat there were two options. The main route was the eastern way, the Chaussée de Gand. As the name indicates this road led to Gent. Thus these maps also show the last stage of the route of the diligence that brought the Brontës to the city (see Calendar, 14 February 1842). The road on the west was quieter. These routes come together in Molenbeek. 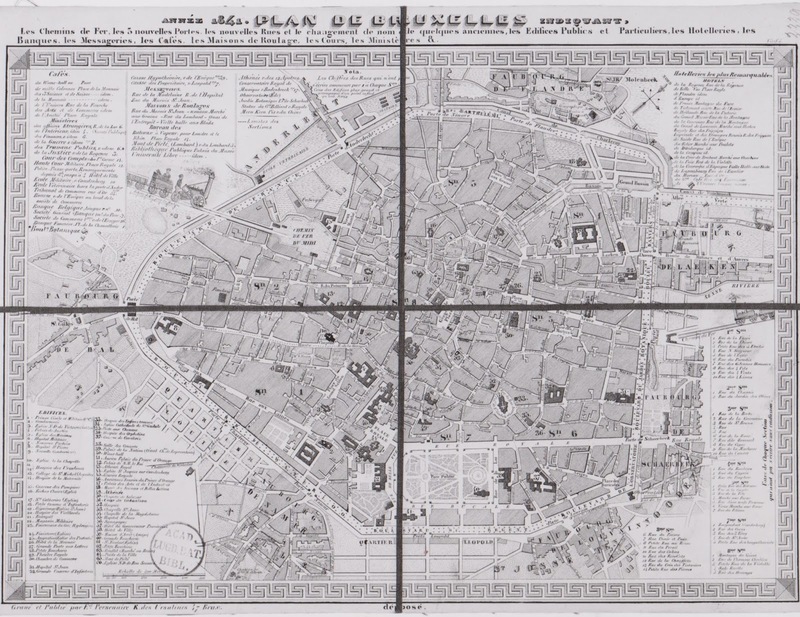 The city was entered at the Porte de Flandre (more about the Portes later). 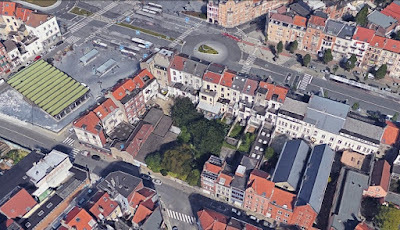 Molenbeek was growing quite rapidly. 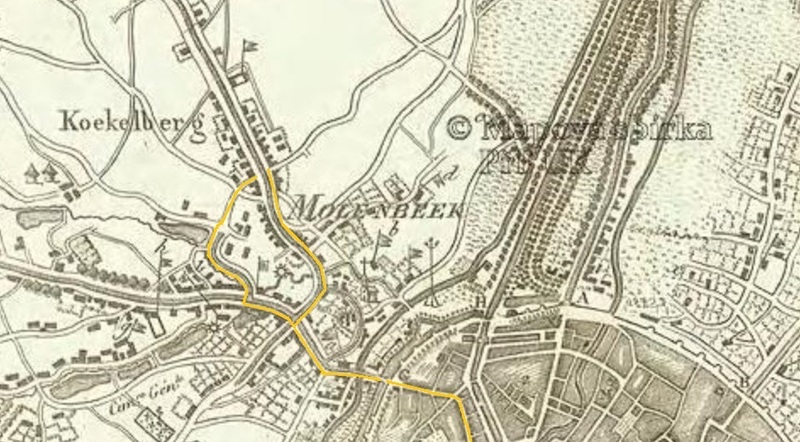 The Journal de Bruxelles wrote on 11 June 1842 that “everyday Molenbeek sees the number of shops and factories growing […], soon this faubourg will no longer form just one group of buildings.” On the 1st of January of that year the number of inhabitants of this town was 7495 (l’Indépendant, 24 Jan). 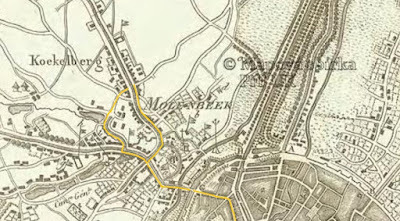 Koekelberg was little more than a hamlet. 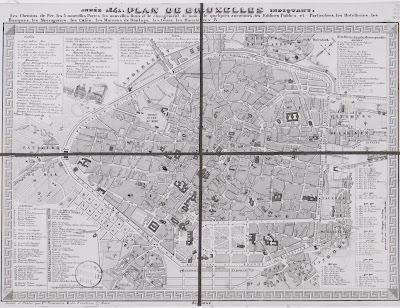 It appears from the newspapers that little had changed since 1830, the year the plan shown above was drawn. Since then though much has, for instance also at the place where the Pensionnat of Madame Goussaert née Catherine Phelps was situated. 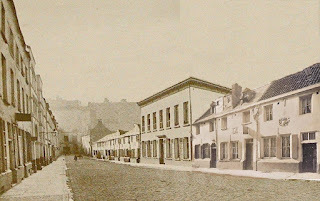 An old painting shows it without any other nearby building. Nowadays the place where the building once stood is completely surrounded by houses and a wall, making it a rather frustrating place for the Brontë traveller. Thanks to aerial pictures we can though see what it looks like behind these houses. There are some big trees now on the site of the old pensionnat, from which Mary Taylor wrote her letters to Charlotte in the autumn of 1841 which inspired her to go to Brussels, with the idea to go to there for schooling. Mary wrote of “pictures the most exquisite - and cathedrals the most venerable” she had seen in the city of Brussels. Surely, Charlotte concluded, it must be “one of the most splendid capitals of Europe.” Mary had arrived in May 1841. She had had plenty of time to see the city. Knowing that Mary and Martha Taylor would be living nearby must have added quite a lot of weight too in the debate about which place exactly to go to. 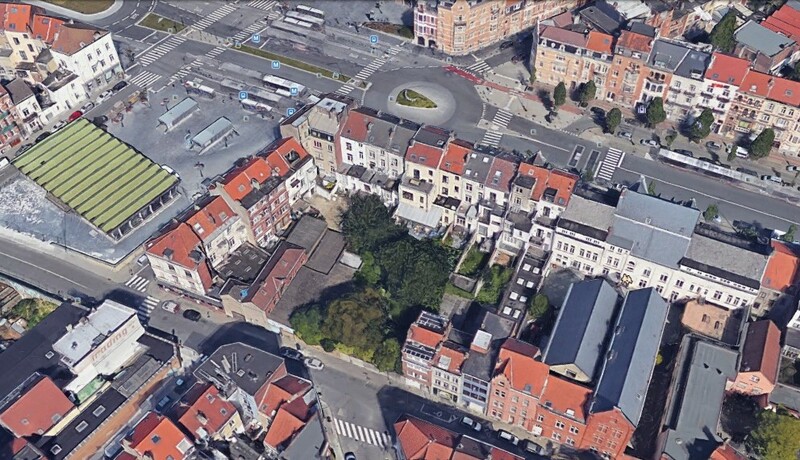 It is in Koekelberg where the Brontë Brussels story started, thanks to Mary, at the site of these trees. Madame Goussaert was a driving force in the village. She was the president of the committee that organized a big art exhibition in Koekelberg in the autumn of 1842, undoubtedly visited by the Brontë and Taylor sisters. It was intended to raise money for a new church. In the 20th century a big basilica would be built in Koekelberg. 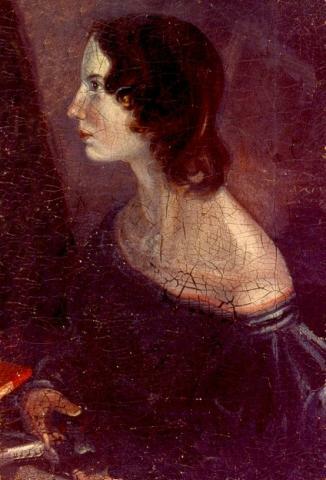 8 February, Tuesday, the Brontës leave Haworth, for Brussels. With Joe and Mary Taylor they traveled by train from Leeds to London where they arrived in the evening. On this day a devastating earthquake took place at the Caribbean island of Guadeloupe. On 13 March the people in Brussels could read about it in the papers, and many more reports, also about charity activities for the victims, would follow, well into the next year. It is therefore possible that this news inspired Charlotte to send M. Paul to this island at the end of Villette. On this day too M. and Mme. Heger might well have gone to the second opening day of the new building of the Salle de la Société de la Grande Harmonie, at the Rue de la Madeleine (in time for carnival, it was noted). It is possible he was a member, as later he would take Charlotte to a concert there. On 11 February the Société Philharmonique opened its new building. At the same time though the concert hall at the Rue Ducale (at the other side of the Park) closed its doors. 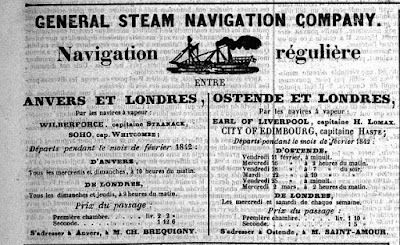 12 February, Saturday, The Brontës sail from London to Ostend. 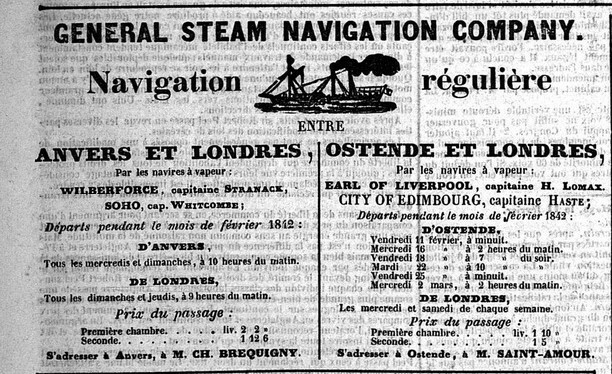 There can be no doubt that on this journey they sailed on the Earl of Liverpool, a steamship of the General Steam Navigation Company (built in 1822). That was the ship that sailed to Ostend on Saturdays. According to Juliet Barker (The Brontës) the voyage took “nearly fourteen hours.” It seems likely the ship left at 9 am, as did those going to Antwerp. 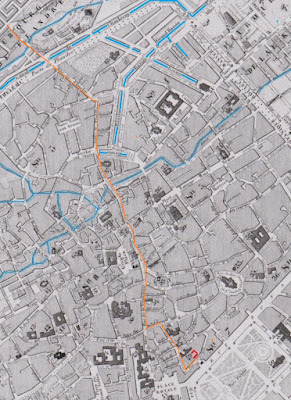 Cartography has been a rather neglected part of Brontë Brussels history, apart of course from the Quartier Isabelle, thanks to Selina Busch. 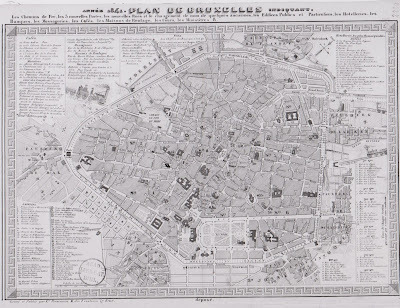 With the aid of computer techniques and an excellent plan of Brussels, dated 1841, it is nowadays very well possible to show the city and all the many relevant places. 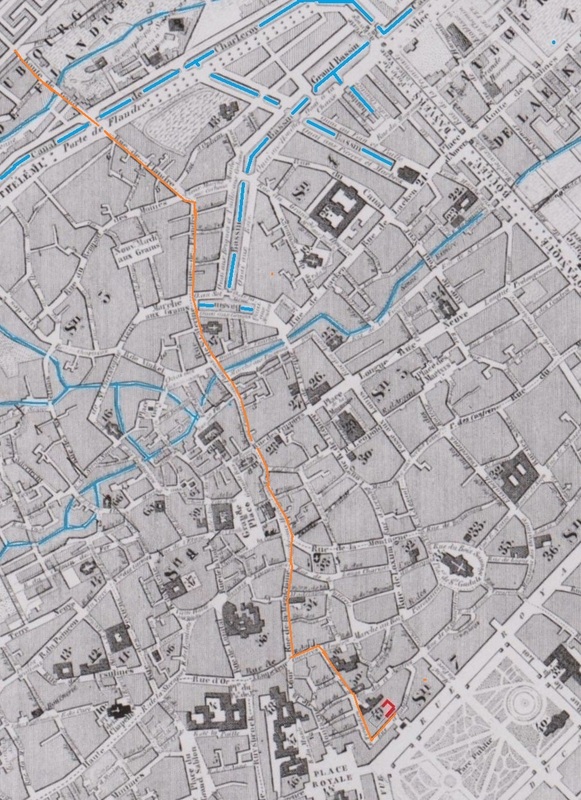 The map gives a very good idea of what the city looked like when the Brontës arrived. It also shows the locations of many specific buildings. It seems possible that the Brontë sisters used this map when going out for a walk, at the beginning. Without a map one could quite easily get lost. The plan is foldable, and as one can see, easily in four smaller parts. We have first digitally removed the black cross lines, which already gives a prettier result. Then a version was made with the Pensionnat indicated on it (in red), and with the Senne river, the Petite-Senne and canals shown too (in blue). It is easy to forget nowadays, as the rivers have completely disappeared from view, but they made the city look rather different. It took almost half a year for news to get from New Zealand (where Mary Taylor was to go to a few years later) to Belgium. The rest of the world went quicker of course. Even so, there could easily be a delay of two, even three days between a news event happening in Belgium and it getting in the newspaper. Three to five days was normal for news from England, which surely the sisters were most interested in, certainly especially during the 1842 summer of (Chartist) unrest in Britain. Belgium was squeezed between three big countries, one slightly bigger country and a tiny one. A young country too, not completely settled yet. Soon after the sisters’ arrival a noteworthy court case began, on accusations of (an Orangist) conspiracy against the state (the big news of March). In 1842 there was still no definitive treaty with the Dutch, following their successful 1830 rebellion. Germany as one country didn’t exist at all but the Zollverein already was quite successful in beginning to unify the country. With Prussia as its most powerful member it was already getting an important economic force. Because of the shared language and close border France was the most influential big neighbor culturally. Economically the country was perhaps more oriented towards Britain. The Belgian king, Leopold was related to Queen Victoria. The Belgian queen was a daughter of the French king, Louis-Philippe. 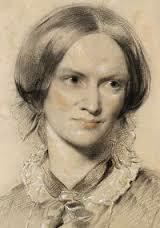 Charlotte Brontë clearly liked living in Brussels. Had there not been this somewhat problematic relationship with M. and Mme. Heger she would certainly have stayed longer. 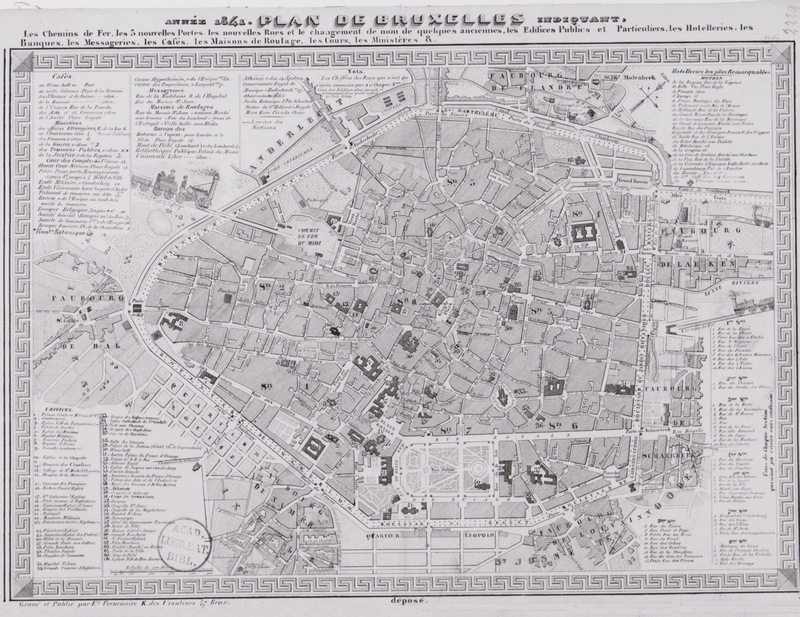 Brussels was fairly small for a capital city, but it had a “cosmopolitan character,” as she says in The Professor. The best artists visited the city for performances, there were very interesting museums, exhibitions, concerts (the sisters may have seen Berlioz and Liszt), theatre plays, flower shows, many bookshops. In 2017 the Belgian Royal Library has digitized newspapers of 1842 and 1843, which give a very good idea about life in these years in general, and life in Brussels in particular. It seems rather likely that Charlotte read one or two of these newspapers that were published. It does at any rate seem certain that the Hegers were subscribed to one or two, possibly indeed those two from Brussels that have been digitized. Lucy Snowe came to Madame “once when she was sitting in the sun in the garden, a cup of coffee at her elbow and the Gazette in her hand, looking very comfortable.” That is surely based on real life. It’s quite unthinkable that the Hegers did not read newspapers. They were the main source of news in these days, it should be remembered. It’s possible they even had the morning edition of one newspaper, and the afternoon edition of another. It also seems more than likely that Charlotte and Emily were allowed to read the newspapers too at the Pensionnat.